Truffle from Mont-Ventoux. Image: Wikipedia. A warmer and drier climate will be responsible for the decline – which will have a "huge economic, ecological and social impact" – and could be accelerated by other factors, such as heatwave events, forest fires, pests and diseases. Dr. Paul Thomas, from the Faculty of Natural Sciences at Stirling, led the research, which is the first study to consider the future threat of climate change on European truffle production. 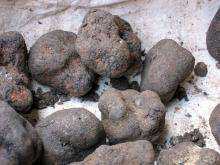 He said: "Our new study predicts that, under the most likely climate change scenario, European truffle production will decline by between 78 and 100 per cent between 2071 and 2100. "However, the decline may well occur in advance of this date, when other climate change factors are taken into account, such as heatwaves, forest fires, drought events, pests and disease. "We risk losing an industry worth hundreds of millions of pounds to the economy. However, the socio-economic impact of the predicted decline could be substantially larger as truffle harvesting and related activities form a key component of local history and cultural activity." Dr. Thomas, working with Professor Ulf Büntgen at the University of Cambridge, studied continuous records, spanning 36 years, of Mediterranean truffle yield in France, Spain and Italy. "This is a wake-up call to the impacts of climate change in the not-too-distant future," Dr. Thomas said. "These findings indicate that conservational initiatives are required to afford some protection to this important and iconic species. Potential action could include the expansion of truffle plantations into new territories of a more favourable future climate. "Management strategies should further include mulching materials and cultivation practices to mitigate soil temperature fluctuations and conserve soil moisture." The study, "A risk assessment of Europe's black truffle sector under predicted climate change," is published in Science of the Total Environment.